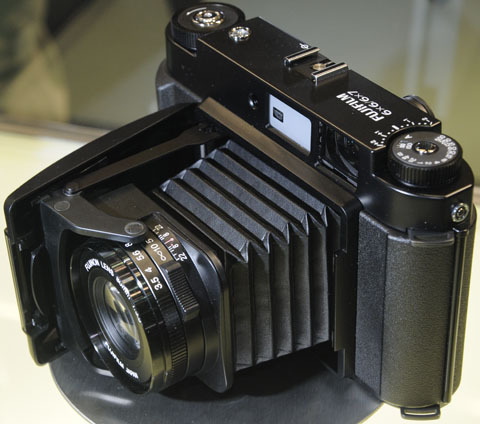 Fujifilm has released further details of its medium format folding camera, which will be sold outside Japan as the u2018Voigtlu00e4nder Bessa IIIu2019. Fujifilm has released further details of its medium format folding camera, which will be sold outside Japan as the ?Voigtländer Bessa III?. We now know that the camera will be equipped with a mechanism for ?switching between two film formats, 6x7cm and 6x6cm?. The camera will come with an 80mm f/3.5 lens (made from six elements in four groups) and will be powered by a CR2 (3V) lithium battery. The camera ? known in Japan as the GF670 ? was developed in conjunction with Cosina, which will handle sales outside Japan. ?The GF670 is a highly portable, folding bellows camera that allows extremely high-quality images to be taken using a high-performance lens unit,? stated a sign on display at the Photokina show in Cologne, Germany. Further announcements on the release of the camera will be made soon, according to Fujifilm. The company first announced plans to develop such a camera at the Photo Marketing show in the United States earlier this year.